Early in January, a bundle of bills quietly passed the House of Representatives. Together, they are radical threats to public health that throw up unprecedented and dangerous roadblocks and delays to sensible safeguards that protect the American people. They aim to weaken—or outright block—the crucial regulations that keep our air and water clean, and our food and children's toys safe. One bill even gives Congress the ability to, by taking no action, prevent existing laws from being carried out. Tell the House: This vote sabotages our safety. I'm disappointed in the House's passage of the REINS Act and the Midnight Rules Relief Act of 2017. I am extremely disappointed that that the House of Representatives recently passed both the Regulations from the Executive in Need of Scrutiny Act of 2017 (REINS Act) and the Midnight Rules Relief Act of 2017. These are direct and radical threats to public health and the environment with overreaching implications and unintended consequences. 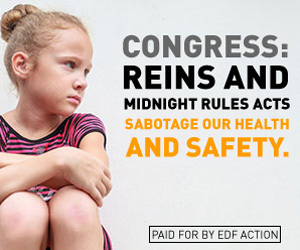 The REINS Act would prevent the federal government from carrying out actions mandated by Congress, including laws with strong bipartisan support, resulting in the failure to implement critical public health and safety protections. By requiring Congress to approve all major rules, it would effectively give one chamber of Congress veto power over any new significant public health and safety protection, no matter how non-controversial or sensible it may be. The Midnight Rules Relief Act, which would allow disapproval of multiple rules finalized near the end of a presidential term, is based on the flawed premise that regulations finalized during the last months of an administration are rushed an inadequately vetted. But rules announced during the transition period have actually taken longer to complete (an average of 3.6 years compared to the 2.8 years for all other rules). These bills throw up unprecedented and dangerous roadblocks and delays to sensible safeguards that protect the American people. When any similar attacks on these crucial protections come to the House floor for a vote, please strongly oppose them.